This post is brought to you by Love With Food. All opinions are my own. I LOVE subscription boxes. I know a lot of you do as well. And there is one that has been out called Love With Food that is all about introducing new all-natural snacks with no artificial junk each month. I have a hard time deciding what good-for-you snacks will actually taste good too, and with this service I don't have to break the bank to try them for myself! PLUS for each box sold, Love With Food will donate a meal to a food bank in the U.S.! This month they invited Healthy Grocery Girl Megan Roosevelt who is a plant-based Registered Dietitian to help with this amazing box. Moringa Organic Tea by Miracle Tree for a quick pick me that I haven't tried yet. Choco Chew by Trujoy Sweets that's vegan, gluten-free, and organic with no artificial colors or flavors and it was super yummy. Annie's Chocolate Bunny Grahams that contain 8 grams of whole grains per serving and my daughter took them as her snack to school with no complaints! Chocolate Banana Mini Snack Bar by 2 Degrees Food that's omega-rich quinoa, chia and millet, but the dried bananas and dark chocolate make them a real treat. Hemp Hearts by Manitoba Harvest where just 3 tablespoons provide 10 grams of plant-based protein! Can't wait to add them to my next salad, wrap or sandwich. Roasted Chickpeas with Sea Salt by The Good Bean where 1 serving contains 4 grams of protein and 4 grams of fiber. Sea Salt Bops by Good Boy Organics that are gluten-free and non-GMO Project Verified baked potato snacks. My daughter and I devoured them. Almond Butter Cacao Truffle by Two Moms In The Raw that are gluten-free, but we haven't tried yet. Nutty Rice Bites with Cranberries by 180 Snacks they were gluten-free, vegan, and amazing. Herbes De Provence by The Spice Hunter where a sprinkle of this Mediterranean mix offers a little dash of sunshine for every dish...or so the awesome insert told me so. 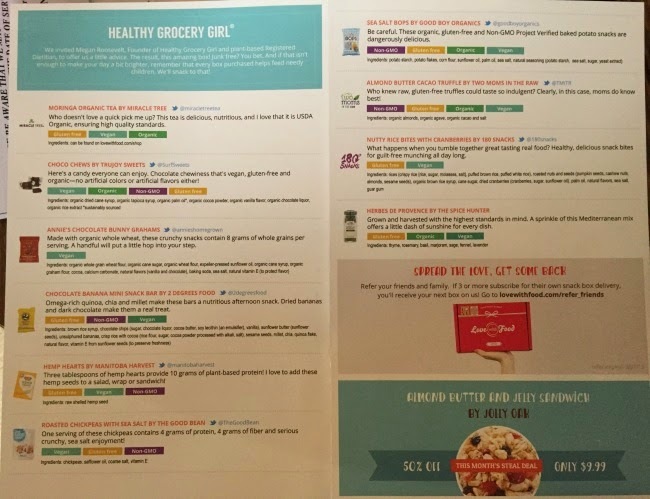 I love that each food is listed perfectly with a description and the company's social media. 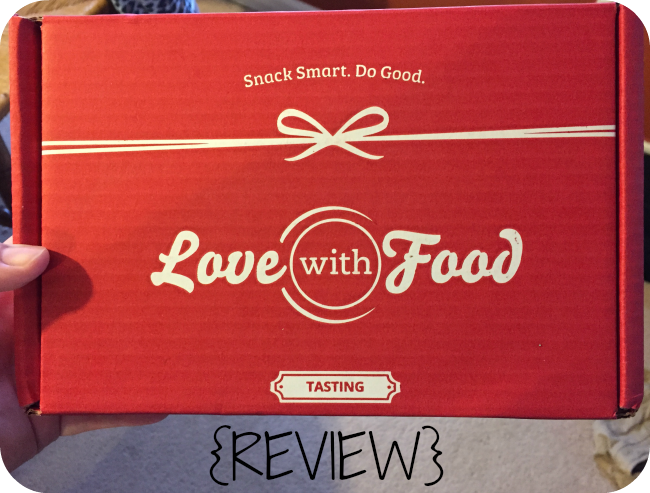 I loved everything we have tried in this box and can't wait to try the rest. the box also came with coupons and others fun flyers as well. And Love With Food is offering MY readers an exclusive offer to try their awesome subscription for FREE, just pay $2 shipping! Just click HERE to sign up! Do you like subscription boxes? Do you try to snack healthy? What do you think of Love With Food? Love with Food is a great sub box. I don't know why I ever stopped getting it..lol..This particular box looks amazing. I always enjoyed that they really gave you all the information about the company and description. Great review. I had to join again soon..
Wow this looks awesome! 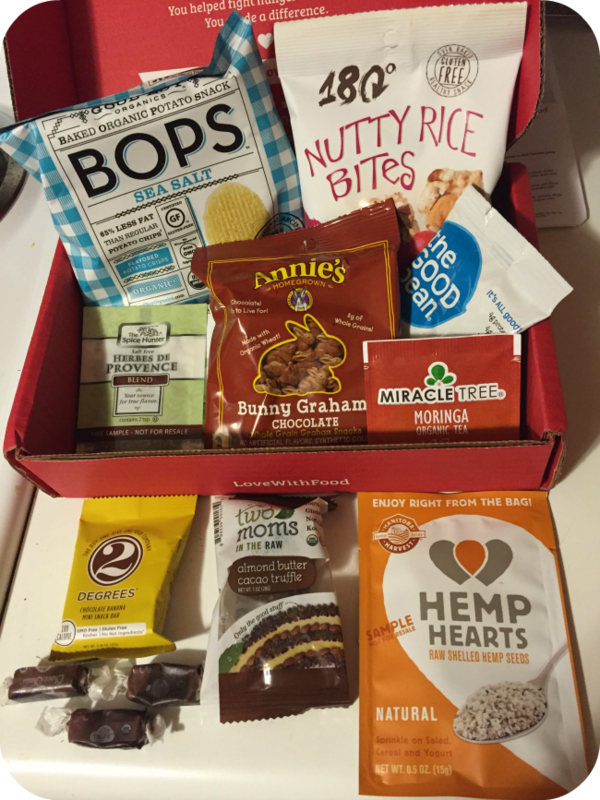 I have always wanted to try it out and your box is great! Thanks for sharing it! :) Looks yummy! !